Over the past few days I've had countless emails about another recent incident in which it was reported that a male elephant named Raju, believed to have been taken from his mother as a baby, cried after being rescued after having endured 50 years of horrific abuse. According to Pooja Binepal, a spokesman for Wildlife S.O.S., “The team [was] astounded to see tears roll down his face during the rescue ... It was so incredibly emotional for all of us. We knew in our hearts he realized he was being freed." In September 2013 I wrote an essay called "Do Elephants Weep as an Emotional Response?" about a newspaper article called "Elephant tears: Newborn weeps after being parted from mother who tried to kill him" in which it was reported that a newborn male elephant "cried for five hours without stopping after he was rejected by his mother." Over the past few days I've had countless emails about another recent incident in which it was reported that a male elephant named Raju, believed to have been taken from his mother as a baby, cried after being rescued after having endured 50 years of horrific abuse. According to Pooja Binepal, a spokesman for Wildlife S.O.S., “The team [was] astounded to see tears roll down his face during the rescue ... It was so incredibly emotional for all of us. We knew in our hearts he realized he was being freed." 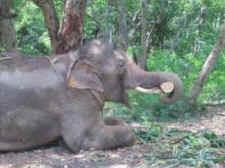 Stories about Raju's plight and tears have been all over the web. In an interview I did for the Swedish newspaper Expressen.Se, I noted that while we really don't have solid scientific proof that elephants (or any other animals) weep as an emotional response, we should keep the door open that they do. This is consistent with what I wrote in my earlier essay, the position to which I still ascribe. My approach to, and take on, these stories, is fairly straightforward. I did a Google search for topics including "Do/can elephants weep? ", "Do/can elephants cry? ", "Do/can animals weep? ", and "Do/can animals cry?" and found some very interesting answers that ranged all over the place from "Sure, they do" to "Probably, they do", to "No, they don't". I also looked for various positions on whether or not crying/weeping were associated with various emotions as they are in human animals. In a nutshell, available information supports the view that other animals do cry and weep and that they can be closely associated with various emotions, including sadness and grief that are associated with loss. So, while we are not 100 percent certain, scientific research and countless stories suggest the view that elephants and other nonhuman animals weep as part of an emotional response. Rather than dismissing this possibility as merely storytelling, which it is not, we need to study it in more detail. After all, "the plural of anecdote is data", and stories and citizen science can and should motivate rigorous scientific research. And, let's not forget that many "surprises" have been discovered in the emotional lives of animals including laughing rats and dogs and empathic chickens, mice, and rats — all published in outstanding peer reviewed professional journals. As with many other aspects of the cognitive, emotional, and moral lives of animals, it turns out that we are not alone, and that human exceptionalism is more a myth than a fact. So, I offer that we are not the only animals who cry or weep as an emotional response and look forward to more research on this incredibly interesting and important topic.